Meet Wiley, the genius trapsmith behind the deadly traps that pepper the pathways of Carrion Tomb. He’s young, he’s super smart and though he believes he isn’t the best little hobgoblet specimen around, he is absolutely sure he has what it takes to keep all the machines and deadly creatures of Carrion Tomb in tiptop shape to get rid of any who dare seek the treasure at the heart of the tomb... until one small team of adventurers change his world forever. 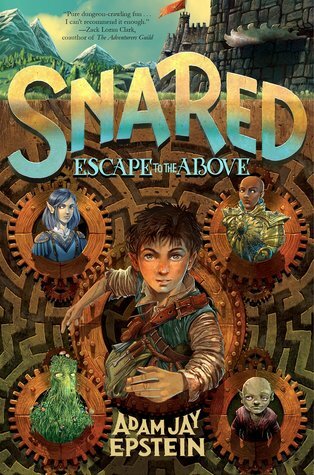 Snared has all the fantasy hallmarks: multiple magical races, evil kings, a hint of destiny and a land in need of freeing. I’ll admit there are a lot of elements here that have been seen before. But what makes this story shine is the sincerity of the bonds these characters end up forging. It was a fun, quick ride and I’d recommend this book to anyone who wants some light middle grade fantasy that ends pretty well. The climax and resolution are pretty simple, though they land on a solid close. If there’s any reason at all for me to want book two (and there are a few), it would simply be because I have grown fond of these characters and want to see what else they get into. 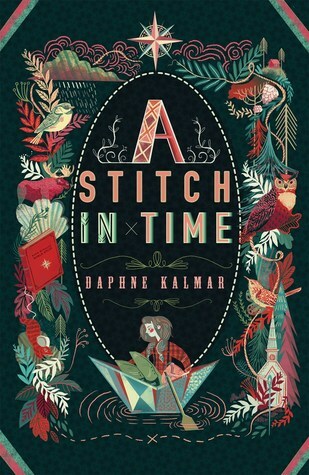 A Stitch in Time is grade A middle grade contemporary stuff. I was hoping for some magical realism, but instead got nostalgia and poignancy in mass quantities. At the center of this story is a little girl who does not want to leave her simple village life, her friends and her budding interest in taxidermy (took me by surprise, but I took it in stride), just so she can be a properly educated young lady in 1920s Boston. Refusing to be called Dorothy and going by Donut instead, she spends the whole book doing what she can to cope with the fact that her guardian/aunt will be taking her away soon. Things escalate the way avalanches do up until the final moment where her fate is decided. I could see this as a slice of life manga/anime because there are so many elements to the story that are picturesque and beautifully played out in their simplicity. It’s not too heavy a read, but it’s certainly not lighthearted fare. The whole time, you can’t help but feel for Donut (and it’s a lot of feelings depending on the type of reader you are). Personally, the ending was not satisfying to me (because I like lovely endings. But objectively speaking, I love how the book ended where it did. The ending made me feel like this was a snapshot of Donut’s life. It was just like stumbling on an old photo album; those albums tell the story of a brief time period and leave the rest of the events to the viewer’s imagination. Still, I would have loved to have found out what happened next to Donut. I mean, what other little girl loves geography and taxidermy and adventures? These things make her a character that certainly grows on you. This early middle grade book is a gem. Bob centers around a little girl named Livy, who flies back to Australia after five years and finds Bob still hiding in her closet as she instructed him to the last time she was there. She has no recollection of him and their friendship and it’s now up to Bob to help her piece the mystery together. That it's told from both Livy and Bob’s first person POVs sort of eliminates any kind of notion that Livy is imagining all of this. The grown up in me was certainly getting that feel from the way Livy’s POV is written. 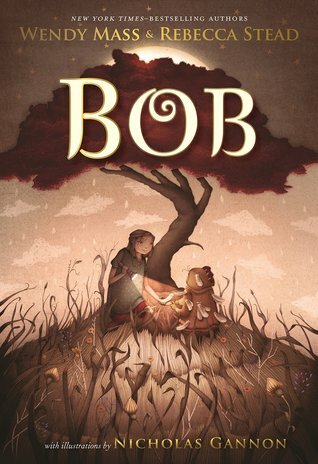 But Bob just comes alive with his lists and opinions and reveries that kids certainly will connect to, and that will evoke different things in any grownups who will be reading. I was all smiles, tears and feels at the end because it’s just so well written. There’s a lot of acclaim for these writers and they certainly deserve it, what with how beautifully done this book is. Taken from Livy’s side only, it’s the story of a girl who finds parts of herself that she’d left behind. Taken from Bob’s side and you get to have that and a pretty decent amount of magic. Yes, magic. Because Bob is so much more than they all thought he was. And when we do find out who and what he is… well, speaking for myself, my world was all the better for it. That said, I don’t know if Bob is a story for everyone. But I would certainly not be shy about asking people (and kids) to give this book a shot.